The subtitle to Imaginative Prayer is “A Yearlong Guide for Your Child’s Spiritual Formation.” That’s right, a “Yearlong Guide.” Boyd understands that it takes time to help a child think about, wrestle with, and finally grasp even an elementary understanding of Who God is and what He is doing in history and our lives. 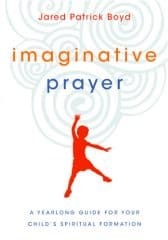 Imaginative Prayer provides a parent or teacher with a helpful resource to utilize in the course of a year to challenge kids to grow in their experience of God and their understanding of the following six themes: God’s Love, Loving Others, Forgiveness, Jesus Is the King, The Good News of God, and The Mission of God. Each theme is addressed in sessions that involve Q&A, help for the parent, and aids for guiding the child in “Imaginative Prayer” which is nothing more than encouraging the child to imagine what it would have been like to participate in a biblical story. Yes, there’s work and time involved, but your kids are worth it! Boyd’s own experience and the practices he’s built into this guide reflect a “contemplative” tradition and view of spiritual formation. Contemplative Christianity may be unfamiliar to some, but don’t let it worry you. In an email exchange I had with Jared, he said… “When I (and others whom I count as part of my stream/tradition) use the word “contemplative,” I just mean a thoughtful and mindful ruminating on our life with God, our spiritual formation (discipleship), and on Scripture. Spiritual formation is just the process of our conformity to the likeness of Jesus…” Jared and I come from different traditions, but I can affirm that statement. The sessions and imaginative prayers included in the book will encourage a child simply to imagine what it would be like to be in a particular situation, biblical or otherwise. Such use of the child’s imagination is no different from any preacher or teacher helping a congregation or learner picture a story and place themselves in it. These sessions are simply placed in a structured and planned context of study through the course of a year. It recognizes that when we use our imagination we become more engaged in the story. A child gets to say, “this is how I would feel or what I would think.” God uses the imagination to help the child (or anyone) connect more closely with the story. This is a good thing. In my mind, this methodology has the following strengths. First, it makes it fairly easy for parents or teachers to lead their kids in a substantive, yearlong journey without pretending it doesn’t require some time and consistent effort. Second, it’s thoughtful and strategic. The six themes (listed above) make sense theologically and are developmentally appropriate for kids. Finally, it’s a flexible plan that allows parents and teachers to adapt to the realities of weekly and seasonal challenges. As with any plan, it will work only as well as you implement it. But, I believe any parent who follows this guide to completion will find it will make a genuine, lasting, and positive impact on the child’s life and spiritual growth.